I'm using 3 of these as my right, left and center speakers. I only paid $89.99 each at PC Richards. Unbelievable price for such a good sounding speaker. These turned out to be real game changers. Incredible sound and clear. But not harsh like some BIC speakers I own for my budget system in my basement. First, I was surprised how powerful they are. My amp/receiver can play much louder at a lower volume level on the receiver, with these beauties. That's because they are very efficient at a sensitivity of 90 dB. They are crystal clear too. I was really very surprised by the bass. Very powerful bass for speakers with such a small footprint and 6.5 inch woofers. You can get away without a subwoofer with these towers. But if you really want to take your music to another level, definitely add a sub like the Polk PSW505. I highly recommend these floorstanding speakers. They are a fantastic purchase when considering quality and performance vs price. These are pretty good speakers for the money. I'm pushing them with a Denon 3808ci and my amp gives these speakers all they can handle. Their rating is 150w max but they sound their best at 100w, at least with my receiver. When I approach the 10+ decibel level listening to music, they start to sound a little strained. However, these babies really shine when watching movies or Dolby digital tv and/or DTS. Very good mid level bass to compliment your sub. I'm pretty satisfied with these and have had them a few years now and been problem free. I have 6 of these set up in my 7 chan. surround using a 800 watt amp. Not only do I hear and notice things that I never have through other speakers they sound better then any other speaker I have heard because they are so plain accurate and warm sounding no matter what I play, via guitar pre amp, rock, country, movies, classic or anything audiable you would have to spend X10 times more to match the sound quality of these units. I push them very hard with my huge amp and they rock and I never blow speakers. Read-TheKid72's review of the Polk R50's- he is pretty much on target. Sounded good for about a day. Like another reviewer, I heard things in my music that I had never heard before. I rate these low because it only took a day for the tweeter in my pair to fail. Polk has diasapointed once before with quality, albeit in car audio. Lesson learned. Save thy money and go for better as I did in car audio. Mids, design, cabinet, appearance, imaging, versatility in placement. Heavy! EXTREMELY LONG BREAK-IN PERIOD! I listened to them for months until they really sounded their best. Heavy! 6 inch woofer helped, but would suggest placing money for deep bass into a dedicated sub to maximize the performance to cash ratio. Denon 60 watt Dolby pro logic reciever. I'm surprised at the "not for music" reviews. No these are not a pair of 12" DCMs that you can blas the neighboorhood with. For music, I like to use the Telarc SACD Sampler 3- Track 9, Another Mind - Hiromi Uehara. You really get a sense of the seperation as the high hat strikes the different speakers. Bass response is great for most music. No- these speakers are not going to rock a Dirty South deep 808 bass track as deep as we want it but they can still hang. Vocals are pretty good if not a bit held back but I can live with that. With a good receiver and sources pushing these speakers, you'll find a great value. Overall natural and neutral tonal balance. Tight, extended bass when used with good electronics for music reproduction. Airy treble and respectable midrange detail for this price point. Nice fit and finish for their cost. At this price point, all audible sins can be forgiven. For many buyers who aren't knowledgeable of differences in brands of receivers, these may be too revealing of other component shortcomings. For those who drive these with good electonics, you'll notice a lack of "space" and 3D imaging - but again look at the street price! The Polk R series has proven to be one of the best bargains in affordable loudspeakers on the market. Any "sins" are of omission such as limitations, as they are impressively free of serious coloration and peaks that so often plagues loudspeakers in this market and real-world street price point. The R50 is no exception, and may be the best bang for the buck of the entire R series. I've read comments that these are great for HT but no music - like heck they are! 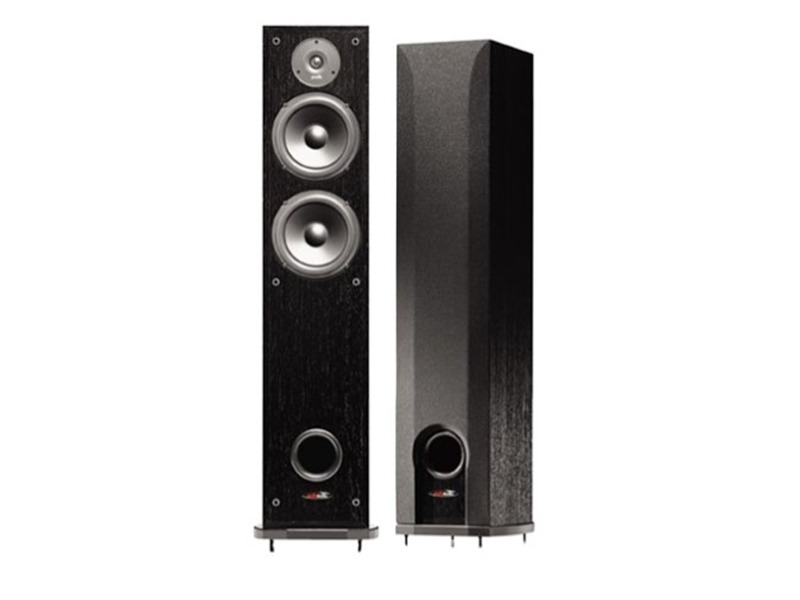 These are a revealing loudspeaker that is not forgiving of the cheap electronics they are likely going to be connected to. When I first purchased them, I had them on a 30 year old entry level receiver where the sound was so-so. Then as I upgraded to a new Onkyo receiver, let the Audyssey system do it's automatic setup, and enjoy. Midrange imaging is impressive . As others have stated, you'd swear there was a center channel speaker installed. On the same token, these aren't so revealing that the image extends beyond the width of their placement - no 3D soundfield here. The image expands from speaker to speaker - no further, no closer or farther away. Treble is pleasantly airy and natural, without any peak to add "zing" to the music. Dispersion is wide, sound is open, transistion from the mid-bass drivers is smooth. Bass - now here is where I have to disagree with most comments about these. In my setup, running them as a sterep pair without a subwoofer, they have more than ample extension for real-world music reproduction. The bass extends below what their 50Hz -3db point would leave you to expect. If anything, if driven by good electonics, most people would not need a subwoofer for music (unless providing the block with music) - but would for home theater. I strongly suspect that those who have issues with limited, strained output are really hearing their receivers run out of clean power. Now I've been an audiophile for decades. I've owned very good equipment both in electronics and loudspeakers over the years. In preparation for a move, I sold everything - now my move has been delayed and I was climbing the walls without music. To say that I enjoy listening to music through these speakers says a lot! In summary, these may be from Polk's entry level point, but they are now emtry level schlock. How good they sound depends on what you are driving them with. Like the Advent Loudspekers of the 1970s (which I owned back then), they are affordable, but don't mate them with budget electronics and expect much. Spend the money you saved by buying these vs. another costlier model - and invest it in the best electronics you can afford. ACI Sapphire, PSB Stratus Silver, Ohm Walsh 2,. Magnapan MMG, Infinity Reference Studio Monitor (pre-Harmon era), M&K S-1 - the list goes on and on. The imaging is great. 7 feet away it sound like there's a center speaker. Great for a 7.1 movie system. Would recommend something higher end for music listening. Not for music listening. Although not bad, most will eventually prefer something higher end. The previous review is correct about the awesome imaging. It does feel like there is a center channel there setting only 7 feet away. Ideal for a 7.1 system. Would recommend something higher end for music listening.